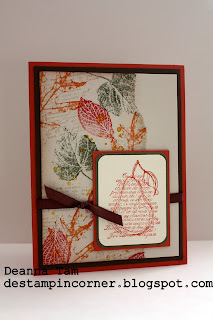 Here a Sketch Challenge #221 over at Stamping 411. My first time joining in on the fun. I'm also joining in on the SUO Challenge 28. This is also my first time joining the challenge at this site. Hope this is ok to post 1 card for 2 different places. I love the fall season so here is a card I made using the French Foliage stamp set again. I did the Faux Tearing Technique for the background. I tore a piece of scrap paper, put on the white card stock and then stamp away. I sponge the edges before I take the paper off. This technique makes nice background paper to match the colours you need for your creations. Beautiful card!! Fall cards are my favorite!! Love the faux tearing!! You faux tearing is just DELIGHTFUL! Love the colors! Thanks for joining us on SUO Challenges! I love this collage look on the left with the clean look on the right. Very different! And it "pears" great together with the main image - heehee! :) Thanks for playing with us at SUO Challenges. Well all I can say is I hope you continue to play... WOW! Your card is gorgeous! Thanks for playing along with stamping411 this week. What a beautiful touch of autumn you've created. Love that faux torn look! beautiful!! I never thought to use these sets together!! I love how you combined these two stamp sets!